Chromate is one of the hazardous toxic pollutants. Reduction of Cr(VI) to Cr(III) has shown to reduce the toxicity of chromate. This work examined the reduction of Cr(VI) using an anaerobic batch cultures of Shewanella oneidensis MR-1 containing Fe(III). To do so, 10 mg/L Cr(VI) was reduced to Cr(III) within 3 days along with the oxidization of Fe(II) to Fe(III). The removal rate of Cr(VI) increased with increasing the concentration of Fe(III). In the absence of Cr(VI), the Fe(II) concentration of the batch culture increased with the growth of S. oneidensis MR-1. These data showed that S. oneidensis MR-1 could reduce Fe(III) into Fe(II), resulting in reduction of Cr(VI) to Cr(III). During this process, the anthraquinone-2,6-disulfonate (AQDS) acted as an electron shuttle. 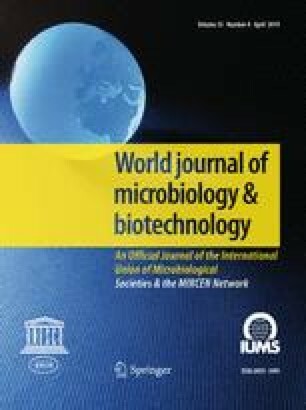 Microscopic analysis showed that Cr(VI) had toxic effects on S. oneidensis MR-1 due to the appearance of Cr species on the bacterial surface. Cr2O3 or Cr(OH)3 precipitates formed during Cr(VI) reduction was identified using X-ray photoelectron spectroscopy. The AQDS as an electron shuttle enhanced the Cr(VI) reduction by S. oneidensis MR-1. Microbial reduction of Cr(VI) can be a useful technique for Cr detoxification. This work was supported by the National Key Technology R & D Program of China (Grant No. 2015BAD05B04), the Fund of Key Laboratory of Soil Environment and Pollution Remediation, Institute of Soil Science, Chinese Academy of Sciences and Key Project of Anhui Provincial Department of Education (Grant No. KJ2016A228).